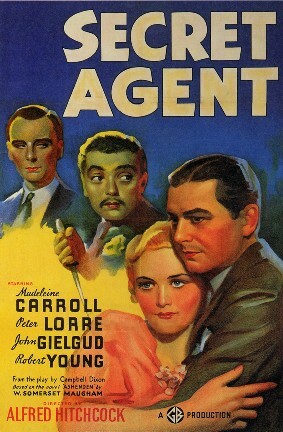 Cast: Humphrey Bogart, Mary Astor, Peter Lorre, Sydney Greenstreet, Elisha Cook Jr. If the superior 1940 B-movie Stranger on the Third Floor can lay claim to being the first true film noir, then John Huston’s first directorial film, The Maltese Falcon, decidedly an A-movie, took the genre to a whole new level. A distinct visual style, a complicated plot, a hard-boiled private eye, a femme fatale, a cast of colourful supporting characters, and crackling dialogue, this film has them all. The story (actually the third filmed version) is based on the novel by former Pinkerton agent, Dashiell Hammett, and features Humphrey Bogart as private detective Sam Spade. This prefigured by five years Bogart’s performance as Raymond Chandler’s private eye, Philip Marlowe, in The Big Sleep. There are resemblances between the two, not least because Chandler himself was undoubtedly influenced by Hammett, and wrote approvingly of his detective fiction in the 1950 essay The Simple Art of Murder. However, Sam Spade is actually a grittier and more cynical character than Philip Marlowe. When, at the start of The Maltese Falcon, he learns that his partner Miles Archer (Jerome Cowan) has been murdered, Spade barely reacts; shortly after this we discover that he is having an affair with Archer’s wife. The day after Archer’s death, Spade tells his secretary to have his partner’s name removed from the office signage. The story begins with Spade being hired by beautiful Brigid O’Shaughnessy (a.k.a. Miss Wanderley) to find her missing sister. However, she is really hunting for the Falcon. Whereas femme fatales typically cause disaster for the leading man, in this instance Spade has her measure right from the start, taking her money but not believing her story. This does not stop him falling for her, and she apparently for him. The combination of love and lying makes for an intriguing cat-and-mouse game between the two. Also hunting for the Falcon are Joel Cairo (Peter Lorre) and Kasper Gutman (Sydney Greenstreet). Lorre gives another superb performance as the (understatedly) gay Cairo, and probably relished this role, coming as it did in the wake of his nine performances as the Japanese detective Mr Moto. Lorre’s opening scene is a masterpiece in how to grab an audience’s attention. It was Greenstreet, though, who got the Oscar nomination for best supporting actor. At the age of 61, it was the first screen role for this 20 stone performer. As Kasper “the fatman” Gutman, Greenstreet is a perfect combination of urbanity and amorality. Gutman is what economists would call a rational actor. He is only interested in what is good for himself. Other people matter only insofar as they have something to offer him and, consequently, he is continually weighing advantages and disadvantages, and is willing to shift alliances when circumstances change. Moreover, he is quite open about all this. When the time comes for him to sacrifice his hired gun, Wilmer (Elisha Cook Jr.), he tells the young man “I couldn’t be fonder of you if you were my own son. But, well, if you lose a son, it’s possible to get another. 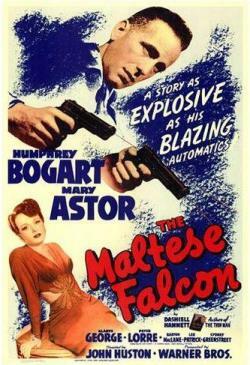 There’s only one Maltese Falcon”. Lorre and Greenstreet aren’t the only actors turning in top performances here. All the key figures are superb. For Bogart, the role of Sam Spade was an opportunity to break away from the bad guys he had been so used to playing, and to portray a rather more nuanced character; Spade is tough and flawed, but beneath it all there is a kind of rough integrity. Mary Astor is delightful to watch as she acts the innocent, vulnerable woman, whilst spinning a bunch of yarns to Bogart. Also turning in a fine performance is Elisha Cook Jr. as Wilmer, the young tough who is continually undermined by Sam Spade (Cook would later appear with Bogart in The Big Sleep). 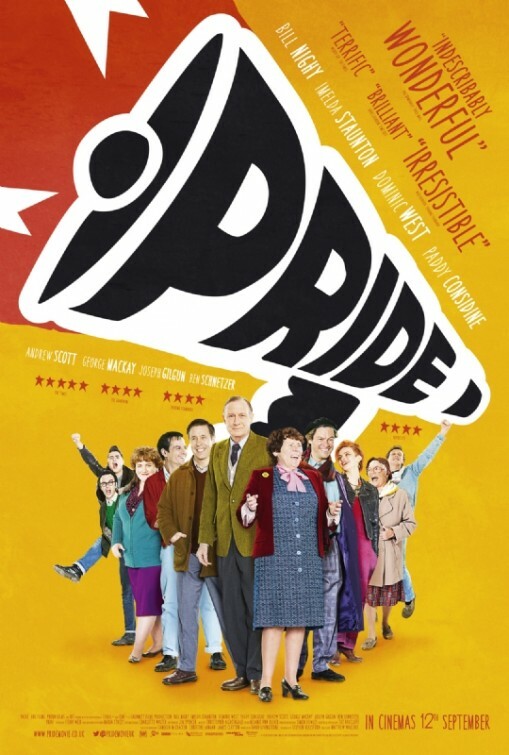 Shown as part of the BFI’s Peter Lorre season, September – October 2014. Cast: Peter Lorre, John McGuire, Margaret Tallichet, Charles D. Warde, Elisha Cook Jr. I have always enjoyed old black-and-white Hollywood movies, even those that aren’t terribly good, and it is always a pleasure to discover pictures that I wasn’t previously aware of. 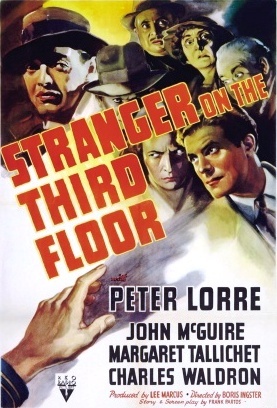 Stranger on the Third Floor is a noteworthy, and rather good, B-movie that is now widely credited as being the first true “film noir”. The film begins with reporter Michael Ward (John McGuire) preparing to testify in the trial of Joe Briggs (Elisha Cook Jr.), who has been accused of murdering a coffee shop proprietor. Ward’s fiance, Jane (Margaret Tallichet), is extremely fretful that Briggs might be innocent, and when he is found guilty Jane’s distress puts something of a strain on her relationship with Ward. Returning home from the trial, Ward notices an odd-looking stranger (Peter Lorre) on the steps of his lodgings. Later, he discovers the stranger inside the building and challenges him, but the man runs away. Aware that he can’t hear the usual snoring from the annoying busybody next door, Ward first begins to worry that he might be dead. Then he falls asleep and dreams that he is being accused of the man’s murder. Upon waking, he goes into his neighbour’s room and discovers that he has indeed been murdered. Ward’s first inclination is to run, but Jane persuades him to go to the police because the victim was killed in the same way as the coffee shop proprietor, and this connection could get the verdict against Briggs overturned. However, Ward then finds himself suspected and the stranger is nowhere to be found. Stranger on the Third Floor is a good illustration of how story and plot are not the same thing. The plot here is remarkably simple and not enough to sustain the film by itself. However, the viewer’s interest is sustained principally through Ward’s paranoid interior monologue and the splendid noirish cinematography. The camerawork and lighting was courtesy of Nicholas Musuraca, who had already worked on a hundred films by this time, and went on to shoot the celebrated 1947 Gothic thriller Cat People. Other important contributors were Vernon L. Walker for special effects, and Van Nest Polglase for art direction. The highlight of the film is Ward’s dream sequence, which features various distorted perspectives, including huge courtroom interiors, and imposing shadows. Top billing for the film was given to Peter Lorre, although he is only onscreen for a relatively short period of time. His performance is essentially a reprise of the child killer in Fritz Lang’s classic M. However, he once again gives an impressive demonstration of how easily he can switch between menacing and kindly (in one sequence, he raises our fears by ordering raw burgers in a restaurant, but then it turns out that he wants to feed a stray dog; shortly after this act of compassion he then menaces Jane). The dramatic finale, when it comes, is perhaps over a little too quickly. I felt that the suspense could have been extended a little further. However, for a B-movie this is definitely above par. Although Stranger on the Third Floor received rather mixed reviews upon release I think this film deserves a rather more positive reevaluation. Shown as part of the BFI’s Peter Lorre season, September 2014.